» home » magazine » 2010 » february 2010 » deformation heating--friend or foe? As soon as man discovered that heat softened metal, the application of heat became part of forming metal. Blacksmiths quickly learned that hammering a room-temperature chunk of metal accomplished very little useful change in its shape—only a rebounding of the hammer. In contrast, heating the metal white hot allowed it to flow into a multitude of shapes, from swords to horseshoes. Heat still is a major player in bulk forming or forging. Application of heat has been extended to sheetmetal. A current example is hot forming of boron-treated steels. The blank is heated to a target temperature of 1650 F and formed. The yield strength is extremely low, allowing creation of complex shapes. If quenched in the die, the microstructure changes to martensite with the attendant 150-ksi minimum yield strength. After reaching room temperature, issues with springback and residual stresses are absent. Schematic of a strain gradient showing both an increase in strain magnitude and localization with increasing deformation. Both examples describe forming after the entire starting piece has been heated. This month the important topic of differential heating is analyzed. Many decades ago, the press shop rule for producing slightly more depth in a deep-drawn cylindrical cup was to heat the binder portion of the die and chill the punch. The intent was to heat the outer ring of the blank (decrease the strength of the deforming cup flange) while chilling the central area of the blank (increasing the strength of the cup bottom that pulls the flange into the cup wall). This process worked best with very slow presses that allowed time to heat and chill the respective zones. In reality, this process was still too close to the edge of the deformation cliff and was not a viable or robust solution. However, it did demonstrate that localized or gradient heating (or cooling) can change the mechanics of the forming process. 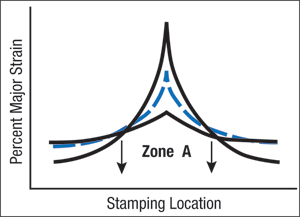 Simply deforming a workpiece creates an increase in temperature in the deformation zone. Press shops often attribute this heating to internal friction. Whatever causes the temperature increase, localized heating accelerates the severity of a strain gradient (see schematic). Assume that deformation begins at zone A. Deformation heating causes a reduction in strength that results in more deformation than in the surrounding material. The increased deformation in zone A creates more heat—and the cycle repeats. The result is an ever-increasing peak strain accompanied by an increasing localized thinning at zone A (to satisfy the constancy of volume rule). Three or four decades ago, Dr. Harmon Nine of GM Research conducted thermal imaging studies of steel stretched over a 4-in.-dia. hemispherical punch. Shortly after onset of deformation, a circumferential band of material around the punch became warmer than the remainder of the dome. As the deformation continued, the zone became warmer and warmer with increasing amounts of strain until failure occurred within that heated zone. Dr. Nine also conducted two additional studies using the same test equipment. First, the rate of deformation was increased. A slow punch speed showed less heating in the previous critical zone but a wider band of heating (trending toward isothermal heating). The heat created in the critical zone had time to dissipate to neighboring material. A fast punch speed showed increasing heating within a narrower band. The heat did not have time to dissipate (trending towards adiabatic heating). The second experiment involved a change in lubricant. A water-based lubricant tended to carry heat a from the critical zone into the punch, while an oil-based lubricant tended to thermally isolate the heating from the punch. Strain gradients are hard to control and are a major cause of variable springback and dimensional inconsistency. Making the problem worse, add the variability of the thermal effect to the strain-gradient variability and the problem becomes more severe. And the problem becomes more complex when heating interacts with the temperature response of different lubricants. To minimize the problem of localized heating in the stamping, dies are being built with cooling-fluid channels to deliver cooling to the punch surface in contact with the strain gradient in the stamping. Even some of the new steels becoming popular today have different thermal characteristics. Friction tests and press shop forming trials of the dual-phase advanced high-strength steels (AHSS) have indicated that these steels become hotter during forming than do other steels of comparable strength. In the press shop, these steels can react differently in the die, create different thermal gradients, develop increased forming severities, and require new troubleshooting skills. A laser temperature gun is rapidly becoming an instrument of choice for analyzing forming problems. An interesting thermal troubleshooting case study entitled “The Die Has a Fever?” was the topic of the Science of Forming column in MetalForming magazine’s April 2004 issue.